When SCA strikes, immediate treatment is critical. 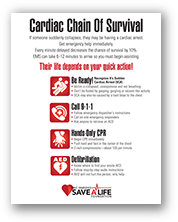 Cardiopulmonary resuscitation (CPR) and treatment with an automated external defibrillator (AED) can help save the victim’s life if given within minutes of the event. The Institute of Medicine reports that the SCA survival rate has remained stagnant at under 10% for three decades. One reason is because bystanders are not prepared or are unwilling to take action in the event of a cardiac emergency. Reports show that 70 percent of Americans either don’t know or have forgotten how to administer CPR—an alarming statistic, given one quarter of Americans say they’ve been in a situation when someone needed CPR. 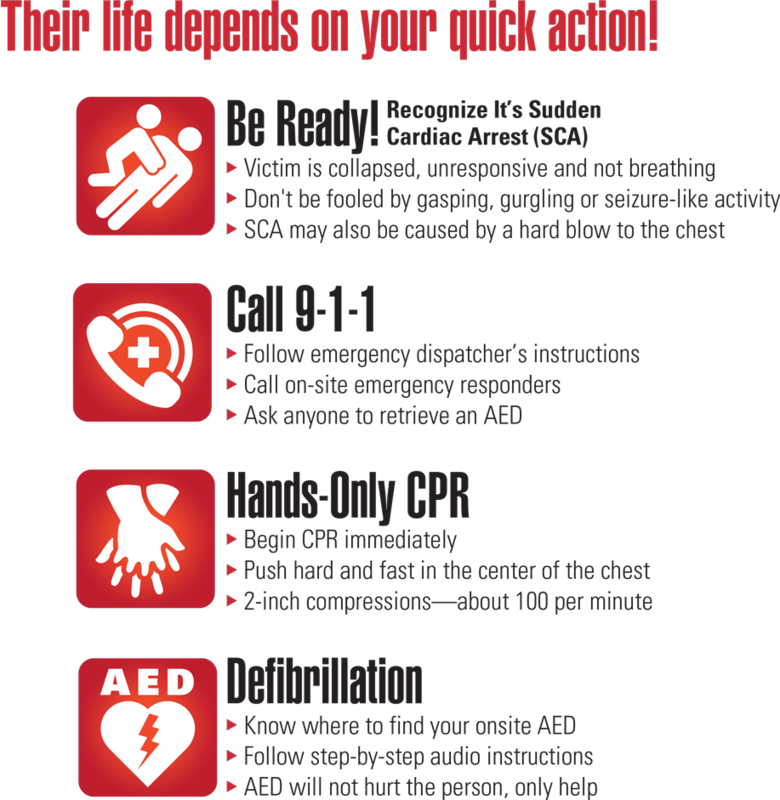 The Institute of Medicine/National Academy of Sciences cites that each year less than 3 percent of the U.S. population receives CPR training, leaving bystanders unprepared to respond to a cardiac arrest. And the chance of survival decreases by 10 percent every minute without CPR. The new CPR standard is hands-only CPR—a departure from the breath/compression combination many of us grew up with. It’s a simple two-step process: clasp hand over hand and push hard and fast in the center of the chest. Hands-only CPR can be a bridge to life until an AED can be used to shock the heart back to life. Defibrillation with an AED is the only way to restore normal electrical activity to the heart and get it beating again. Sadly, there are too few public access AEDs, so bystander CPR is even more critical until EMS arrive. What’s more, the national average for EMS arrival is six to 12 minutes. A sudden cardiac arrest victim can easily die in that short window, so people on the scene must begin assisting. You can double or triple their chance of survival. Their life literally depends on your quick action. 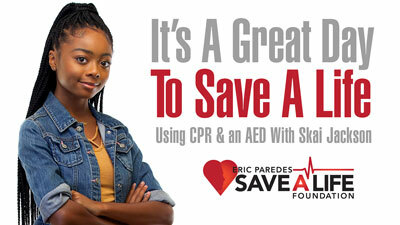 If you need more motivation to learn CPR and how to use an AED, consider this: The American Heart Association reports that 7 in 10 SCAs happen at home, so you may save the life of someone you love. Need help funding an AED? Various organizations accept grant applications to support schools, and others help schools raise money. Also try civic groups such as your local Rotary, Lions, Kiwanis, Moose Lodges, Masonic and Optimist clubs. Why don’t people take action when someone goes in to sudden cardiac arrest? They don’t recognize sudden cardiac arrest—they assume the person has fainted and waste time trying to wake them up. They are unsure of how to perform CPR. They think an AED is only for medical professionals, but AEDs are specifically designed for anyone to use. The AED has audio instructions that walks the bystander through the necessary steps. They think they will hurt the victim. The truth is, the victim’s heart has stopped so anything they can do will only help. Further, an AED device will only shock a person with no heartbeat, so you can’t mistakenly use it on someone who is not in cardiac arrest. They are worried they will be liable, but The Good Samaritan Law is a national standard that protects anyone who tries to help a sudden cardiac arrest victim.